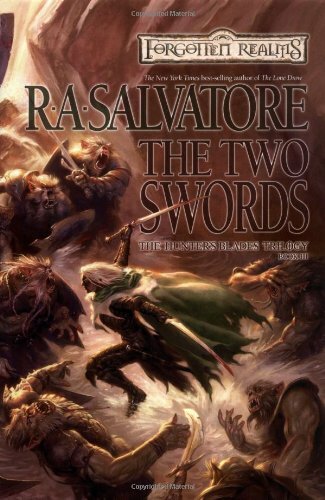 The final title in the latest New York Times best-selling trilogy from R.A. Salvatore. This title is the third and final hardcover release in the latest trilogy from R.A. Salvatore, which once again features his popular dark elf character Drizzt Do'Urden. Both of the previous titles in the series were New York Times best-sellers upon hardcover release, while the first title in the trilogy, The Thousand Orcs, hit the list upon mass market release as well. The second title in the series, The Lone Drow, had the highest debut ever on the New York Times best-seller list for a Salvatore title with Wizards of the Coast, Inc. at #7, and it stayed on the list for 10 straight weeks. As The Two Swords begins, newly ressurected dwarven King Bruenor Bruenor Battlehammer and his subjects are sealed in Mithral Hall. Beyond their gate lies the slavering orc army of King Obould Many Arrows, who schemes beyond the mere death of dwarves and seeks to establish an honest-to-Gruumsh kingdom--the Kingdom of Dark Arrows--at the foot of Mithral Hall. Meanwhile, the dark elf Drizzt Do’Urden still believes his dear companions dead and seeks to exact his vengeance on the mighty orc king. But Drizzt and Bruenor may have met their match with Obould. It will take a new dwarven-elvish-human alliance and dark pacts with the likes of the evil frost giants and a familiar sentient sword name of Khazid'hea to be rid of this new orcish blight.